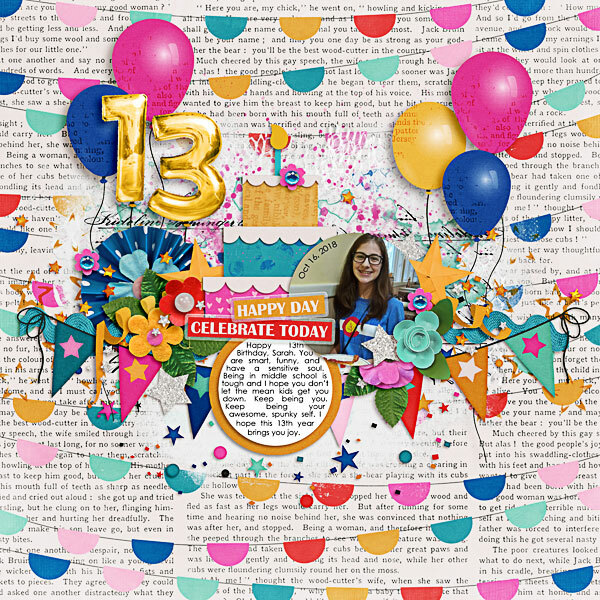 Love that background paper, the balloons on either side of the layout and the movement across the page. I love the balloon 13 and your gorgeous shadowing is just perfect! Stunning page! This popped out of the gallery with all those colors and the placing of the balloon is perfect! Oh! Another stunning birthday page! Love your background paper choice for this and all the balloons! Such a fun page! I love the energy. I agree, such a stand out and fun page. Love the use of the themed goodies - especially the banner background paper and balloon numbers. Love how the balloons really stand out and love the smaller more subtle clusters! Love the bright colours. I especially love the background paper and the gold 13!